If you're a pug lover or know of someone who is, this little guy can surely be a great addition to have! I'm sure he'd lighten up any office desk, bedroom, or softie collection! 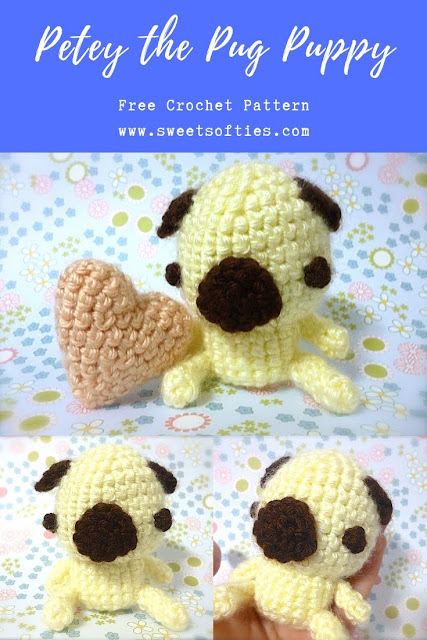 Please find the free & original Sweet Softies crochet pattern below. Happy crocheting! Copyright Notice -- © 2012 Sweet Softies (www.sweetsofties.com). You have permission to sell finished products made from this pattern, but you must credit Sweet Softies as the owner/creator of this pattern by linking to my website, Etsy shop, and/or Facebook page. You may not copy, alter, or sell this pattern in any way. You may sell finished items made with this pattern if you credit Sweet Softies as the designer and link to my website (www.sweetsofties.com). No wholesale. The Petey the Pug Puppy is an adorable amigurumi project that is suitable for beginner crocheters! Petey makes a great gift for any dog or pug lover, or even animal lover in general, because he's just too cute like that! Beginner. Requires familiarity with the stitches used (below). Fasten off and weave in the loose end. Stuff the head. Then, sl st into first st of R1, and fasten off. Leave tail for attaching to head. R1: ch 2, 3 sc in first ch. R2: ch 1, turn, 3 sc across. Fasten off and leave tail to attach to head. Fasten off and leave tail to attach to face. Fasten off with a yarn tail to sew to the head later. Stuff the body. R4: sl st into second sc of R3. Fasten off with a yarn tail to sew to the body later. R5: sl st into third sc of R4. Sew the nose, eyes, and ears to the head first. Then, sew body parts (arms, legs, and tail) to the body. Lastly, sew the body to the head, and voila, you have a cute puggle ready for some cuddles! I made this and found that the head is much larger than I anticipated. It doesn’t look right. Did anyone else have problems with this?